We sit down for the big banquet at the ACC Football Kickoff last night, and my wife, a Virginia Tech alum, class of 1999, notices somebody familiar at the next table. But she didn’t bother him. 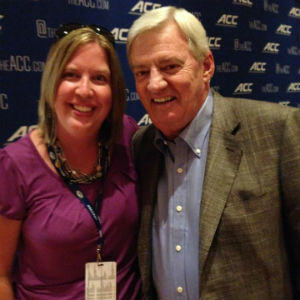 Somebody else had just engaged Frank Beamer in conversation. Bother? She swooped in for the kill. This is the ACC Football Kickoff, as much as it is interviewing players, coaches, ACC Commissioner John Swofford, the assorted blazers representing the bowl games. We get off the elevator and pass Heisman Trophy winner Jameis Winston. We walk down the hall to head out to the pool and ask Virginia Tech’s Luther Maddy and Willie Byrn why they’re not playing golf. We want to get into the hot tub, but a group of assistant coaches, couldn’t make out where from, had taken it over. The payoff is the little stuff. Like me posing for a photo with the ACC Football Championship trophy, then snarking on Facebook about how that’s as close as they’ll ever let anybody associated in any way with the University of Virginia to a football championship trophy. 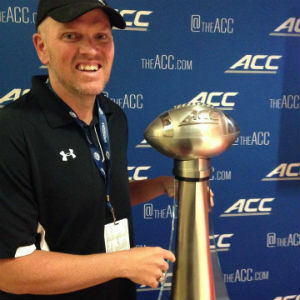 The ACC is just lucky that due to the UVA running through my DNA I didn’t somehow fumble the trophy into oblivion. Leaving tomorrow, it’s time for us all to get to work, the players and coaches to build toward season openers on Aug. 30, the writers to do whatever it is that writers do to get paid by pretending to offer insight in exchange for more opportunities to hang around pools and play golf and take photos of themselves with trophies. It’s an honest living, at least.